Overall: One of my new things in 2015 are holiday anthologies. I enjoy getting a little nugget of a story from a new or favorite author, while also experiencing some holiday cheer in the process. It’s as close to multi-tasking as I get with reading. This romantic holiday anthology has a little bit for everyone who is either celebrating and/or avoiding the holidays. It provides the same level of harmless comfort as turning on the ABC Family channel during its 25 Days of Christmas. The sweet, sentimental stories revolving around love, hope, and expectation will leave you feeling lighter and hoping for a Holiday miracle. In the essence of time, I will provide a listing and a short synopsis of each story. The titles indicated with asterisk are my favorite and include my favorite quote from the story. Midnights by Rainbow Rowell: One Day meets When Harry Met Sally meets a basement party (and food allergies), but told in a charmingly sweet way that could only be Rainbow Rowell. The Lady and the Fox by Kelly Link: This story was read by the same narrator as The Scorpio Races, which lulled me into the happiest of places, however, it was really filled with magical ghosts and kissing cousins. Merry Christmas! Angels in the Snow by Matt de la Peña: A story that surprises, saddens and then uplifts you. Krampuslauf by Holly Black: It wouldn’t be a Holly Black Christmas without a little darkness mixed in with holiday cheer. A super-precious (ala Accident Season) holiday party changes gear mid-way through the holiday cheer. Beer Buckets and Baby Jesus by Myra McEntire: A country Christmas that begins with a Church burning and doesn’t progress in the way you’d think when introduced like that. The Girl Who Woke the Dreamer by Laini Taylor: A wonderfully dark and weird tale that only Laini Taylor could weave into a Christmas story. Judge a Book by its Cover: The American cover of MTLGTM is perfectly festive and generically adorable. But what originally caught my eye was the UK version, which comes with either a blue cover with pink pages or vice versa. Audiobook Narration: Each story was voiced by a different narrator, who was perfectly chosen to accompany their story. I would say that the audiobook adds just the right touch and is possibly better than the experience of just reading the book. I highly recommend this format, if you can find it. 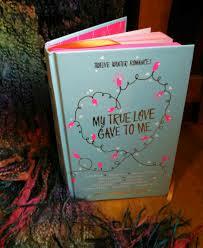 You can get your copy of My True Love Gave to Me in time for the holidays here.